How Konglish is born – Hello Korea ! This, my friends, is part of Chevrolet’s huge advertising campaign lining the subways of Seoul. Now I know why my co-teacher called Chevys Shaebis, ’cause some numb nuts spelled it 쉐비 way back when GM and Daewoo first started their partnership. What I’m confused about is the phonetization of the sign above: Shouldn’t the last one be [leɪ]??? 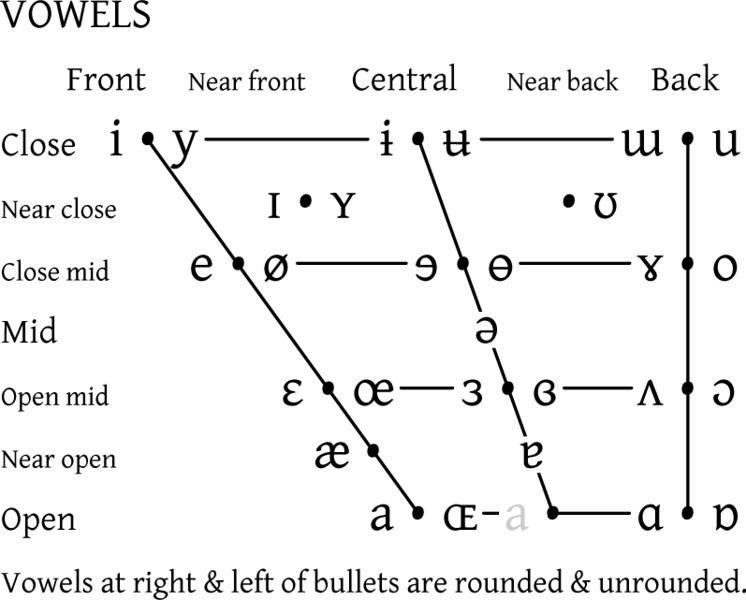 Interestingly, the vowel chart shares a lot of similarity to the hangul vowel chart – it’s all based on the locus of the sound formation within the mouth. The problem with hangul, though, is it doesn’t have vowel or consonant combinations or blends, which is fine for Korean but presents a blunt tool for dealing with foreign languages. Take “vo” for “vro” in the above Chevrolet example. So I corrected the situation and taught my co-teacher that it is pronounced 쉐브로레 in America. 브로 (beuro) is the closest one can come to the consonant blend VR. So it can drive a westerner a little crazy living here, as sometimes the western word is introduced with attention to detail and care not to just eliminate R,L, T, N, etc. sounds from consonant blends, and then sometimes, as with Chevrolet, somebody just decided that extra R wasn’t worth the bother. You get used to it. You accept it. But I guess I was just floored by the amount of money spent here on getting the public to pronounce it wrong when they had an open opportunity to do it right! Boo on you, Chevrolet! I get so annoyed at this particular example as well, especially because the whole concept (컨셉 – another one) of the ad is that Chevrolet is really easy to pronounce, you just have to say it like “쉐보레” and you’ve got it – thanks patronising advert for educating me. Oh, wait, that’s entirely incorrect. If they had just made a regular advert showing the car driving around some scenic road and going on about the quality of the engine or something, and just threw the word in there pronounced wrong I wouldn’t think too much of it. But to make a whole campaign about teaching people how it’s supposed to be pronounced and then do it wrong… Very vexing. Then again, I remember seeing a Hyundai advert for the US market teaching people how to pronounce Hyundai, and saying it rhymes with “Sunday.” Another ridiculous fail. And to be fair, that was a couple of years ago, so maybe Chevrolet are just getting revenge for a Korean car company teaching Americans to pronounce a name wrong. But to be fair to Hyundai, with that Romanisation, people all over the world are going to pronounce it wrong. By the way, I would say the nearest Hangeulisation of Chevrolet would be 쉐브롤레, otherwise you end up with a sound that’s closer to an English “r” than an “l” at the end. Thanks for the correction! That totally makes sense. I’m actually a little surprised how popular this post is. It’s kind of interesting how that image was taken down…I shoulda down-loaded instead of just linking it! If my phone hadn’t drowned in the toilet, I would have had my own picture. BUT – if anyone would like to see the thing larger than life, one of the locations I saw at was the Gwanghwamun subway station, but you better hurry before they take it down in shame! I neglected to acknowledge my head nodding in agreement at your comment, Seamus. It definitely was patronizing and it left me with an euww-ick feeling of shame as a Westerner. However, I suspect it has nothing to do with revenge – from what I read, the Daewoo/Chevrolet partnership up to this point has just been a re-branding of Daewoo and this is the beginning of actually introducing the imported package. It would seem to me that Chevrolet allowed the locals to market this here and they made this campaign to appeal to Koreans, but didn’t check their copy or consult/fact check with Westerners prior to launching. I often feel lately that, as mastery of English increases and more and more gyopos return, Korea feels they have invested enough and know enough to no longer need consultation from the outside world. They don’t understand the nuances of Western culture and run the risk of these kinds of blunders far too frequently. These days the climate is to accept the mispronunciation of English as a valid additional iteration/form of a local English, which I tend to agree with – because the purpose of language is to communicate, not impose rigid perfect order. But I don’t agree with this when it comes to the patronizing you isolated and when it comes to global commerce. I feel it’s a big mistake for Korea to ask the world to look at them as world players and then conveniently assume nobody is watching when it requires them to make an extra effort in regards to global branding. I feel It’s really irresponsible. Oh, and Korea, if you’re listening – you’re wasting a real opportunity not employing Korean adoptees as consultants. Your Korean diaspora typically re-create Korean culture to as much extent as is possible wherever they go so they don’t have the full Euro-centric/non-Asian experience, but Korean adoptees not only live as part of the non-Asian cultural world yet also understand the implications for Asians. We can tell you when your advertising hurts the Asian image in, say, America. And we can tell you when your advertising hurts your ability to communicate with the West here in Korea. Instead of discriminating against us when we come here for jobs, you should view us as a great resource and literal bridge between ethnicity and culture. But you’re in too much of a hurry to stop and consider things deeply. And you still look at us with shame and envy? How much global face could we save you? “Instead of discriminating against us when we come here for jobs, you should view us as a great resource and literal bridge between ethnicity and culture.” Cannot aggree with you more. Korea needs to wakeup to the fact that they got a real diamond and its not in the rough. This concept can also be extended to gyopos being discriminated in teaching jobs because that don’t look white. Some of these gyopos are second generation Americans with degrees from ivy league schools. Wakeup korea.